Shoulder blade pain is usually caused by tight muscles and trigger points in the region of the shoulder girdle. A self-massage of the affected muscles often relieves the pain within days and eventually leads to its elimination. On this page, you will find out which muscles are likely responsible for this kind of pain and how you can massage those muscles yourself. Pain in this area is a “widespread disease” and is often perceived as tensional or burning pain. The causes are usually “poor posture”, the lack of exercise or even too much sports. Follow the instructions below and inspect the muscles or areas of the body presented. A massage is only necessary if the affected muscle or the affected area is tense, painful or tender. Why? Healthy muscles do not respond to pressure that is not excessive with pain or hypersensitivity. Your task now is to find out which muscles are tense or painful and then massage them. In your case, it may be that you will feel pain in all, or just one of the muscles described below. This varies from individual to individual. Always pay full attention to tense, painful or pressure-sensitive spots in your muscles. Do this massage with a ball, or use the finger or pressure-motion technique. To eliminate the pain with a self-massage, you must be very precise. Don’t waste time rubbing and kneading your muscles with no coordination. For this area, I recommend using a massage ball. 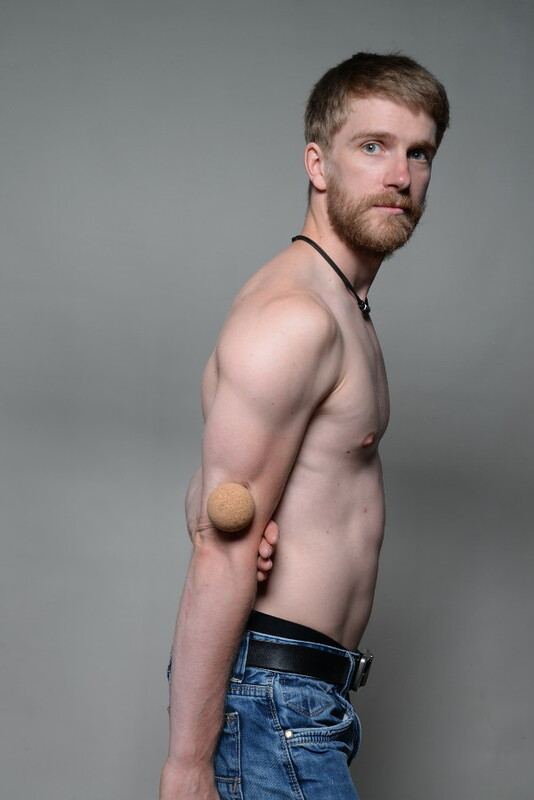 With a ball you can comfortably and effectively work on the shoulder blade region. Begin your massage on the lower, outer edge of the shoulder blade. You can feel it when you insert your opposite hand under your arm and place it on your shoulder blade. Here you will be massaging the latissimus dorsi, teres major and teres minor muscles. Place your ball there and search the entire area of the lower tip of the shoulder blade and its outer edge for painful spots by rolling your ball over it. Stop at every sensitive spot and massage or “roll it” a few times. Painful tension can usually be found in the area of the lower shoulder blade and at the transition between the shoulder blade and upper arm, in particular. When you are finished with this area, repeat the entire procedure on your shoulder blade. The muscle located there is the infraspinatus. Finally, let’s check your supraspinatus, which is located above and “on” your scapular spine, respectively. This muscle will be worked with the pressure-motion technique. For this, use the Trigger Fairy or your fingers. The massage in and of itself is no different, regardless of which tool you use. Start by palpating your scapular spine – the bony elevation that extends horizontally on the shoulder blade. Once you’ve found it, press on the muscle directly above it. Raise your arm slowly a couple of times. Experiment with the position of the Fairy or your fingers. Shift a bit more to the right or left to see where the massage feels best or where you hit the most sensitive spots. Trigger Fairy directly above the scapular spine. Pressure-motion technique with the Fairy. Finger directly above the scapular spine. Pressure-motion technique with your fingers. Here you will be massaging the entire area of the inside of your shoulder blade(margo medialis). From the bottom to the upper tip. I will be showing you two positions for this. First, the neutral position and, second, the position in which your shoulder is rotated. The latter is important for reaching the muscles located underneath the shoulder blade. To work on those muscles I recommend a massage ball. Let’s start with the neutral position first. Let your arm hang loosely and place the ball between your spine and the inner bottom of your shoulder blade. Slowly roll up and down. Stop at each painful spot and massage it 10-15 times. In this position, you will be massaging the middle and lower part of your trapezius as well as the levator scapula. It is not unusual for this whole area to be sensitive to the point where it is difficult to actually find individual spots that are painful. In this case, simply work, slowly but surely the entire inside of the scapula upwards until you reach all the way to the tip. Do not forget to massage it, too. Now, in order to massage the serratus posterior superior, you must rotate your shoulder balde. This is the only way you get on its fibres. Always keep this muscle in mind because it is almost always involved in shoulder pain. Cross the arm on the side to be massaged in front of your body and hold it in this position. Only this way the muscle fibres are exposed. You cannot reach them in the neutral position. Repeat the steps from the neutral position. Inspect the entire area of the inner shoulder blade. Once you have massaged the areas on and near your shoulder blade, focus on the areas on the side and rear of your neck. The technique I recommend is the pressure-motion technique. For this, the Trigger Fairy is the tool of choice, but you can also use your fingers. If you decide to use your fingers, make sure not to overwork them— especially if they are not very strong. Place the Trigger Fairy or your fingers on the affected side of your neck. Press in this area and check if the muscles are painful. Slowly work your way up towards the back of your neck and your cervical spine, respectively. Stop at each painful spot and massage it a few times. Alternatively, keep applying pressure while moving your head. Do a couple of Yes-No movements or tilt your head to one side. Try to see which one of the movement feels best. Trigger Fairy in the upper region of ​​the levator. Trigger Fairy in the central region of the levator. Fingers at the upper region of the levator. Fingers in the central region of the levator. For this area again, I recommend using a hard massage ball. Place the ball at the back of your upper arm, just above your elbow. Now, search the entire region of your rear upper arm for painful tensions by rolling the ball over the area. Massage each of these tense spots with slow, short, back and forth movements. ... the inner area of ​​your triceps. Finally, let’s have a look at the area of the inside of your armpit. Sit on a chair and let the arm of the affected shoulder hang loosely. Use your thumb to gently press deep into your shoulder towards the shoulder blade. Rotate your arm toward the inside several times. When doing this internal rotation, you should feel how the muscle – the subscapularis – tenses. Stop rotating your arm once you have found the muscle, which you will then massage 10-15 times using the thumb technique. Important: Make sure that you are staying on the muscle during the massage since many nerve plexuses run in your shoulder region. Advance slowly and stop your massage as soon as you feel a burning or tingling sensation beneath your fingers. This is usually a sign that you have touched a nerve and should get back to the muscle. In addition to the pain in the shoulder blade, it may be that you experience problems or pain whenever you rotate your shoulder or raise your arm. These symptoms, however, disappear as soon as the tension or trigger points in the muscles mentioned above are eliminated, i.e. have been “massaged away”. Provided, of course, that these problems were of muscular origin.